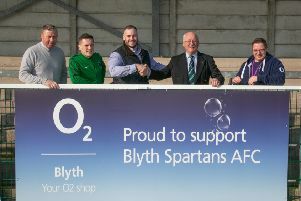 The champagne is on ice at South Newsham as Blyth Town went down to only their second defeat of the season at Whitley Bay A. Northern Alliance Newcastle Building Society premier division leaders Town were beaten 2-1 thr0ough an own goal and a Dillon Blake effort. David Robinson scored their consolation. Carlisle City were beaten 3-1 at Walker Central with goals from Steve Hurd, Matty Hayton and David Kane, and although Marc Shiel netted from the penalty spot, the Cumbrians cannot catch Blyth if they secure just three more points from their final four games. Craig Boyle hit four and Anthony Errington got the other in North Shields Athletic’s victory over Northbank. Adam Clark and Mark Worrall replied. First half goals from Kyle Reardon and Alex Slack gave Wallington the points at Ashington Colliers. Lee Waugh slammed home a hat-trick in Killingworth Station’s win over Rutherford. Steve Brown (2) and Shane Broooks netted for Red House Farm at Seaton Delaval, who pulled one back through Callum Gibson. Robbie Frame also bagged a brace for Whickham Sporting at Shankhouse. An own goal and a Scott Robson strike completed their tally, with Lee Gustard notching at the other end. In the Nike first division, a first half double from Jorge Bollardo at Blyth Isabella put Percy Main back in the top flight. The Villagers are now zeroing in on the title and it is hotting up for the second promotion spot as Wallsend Boys Club beat AFC Newbiggin 5-2 with goals from Daniel Hindmarch (2), George Robinson, Nicky Whitelaw and an own goal. The Seasiders’ Kevin Halliday struck twice in reply and they had keeper Craig Towart sent off. Oliver Todd and Jack Taylor were Newcastle Uni’s scorers as they beat Bohs to retain fourth spot. Andrew Dalton replied. Lee Cuthbertson, James Ward, Tony Smith and Kevin Wright were Birtley Saint Josephs’ scorers in their success against New Fordley. Danny McDonald hit the only goal for Cramlington Town at Chemfica. Dan Gray’s strike gave Bedlington Terriers Reserves the points against Wooler. In the Bay Plastics second division, Shilbottle CW’s Josh Hay slammed home a treble as the Colliers reduced Gateshead Leam Rangers’ lead at the top to seven points. Matty Graham added two more with goals from Phil Grey and Richard Brown completing the total. Michael Old struck twice for hosts Wideopen. Declan King hit the only goal as Wallsend Labour Club stunned leaders Leam Rangers. Francis Storey, Paul Ridley and Lewis Walker netted in Forest Hall’s success against West Allotment Celtic A.
James Jackson and Ryan Taylor both hit doubles for Alnwick Town Reserves and Niall Younger netted a consolation for Cramlington United. Longbenton had Chris Scott on the scoresheet in their win over Seaton Burn. Liam Roberts and Dayne Weir crashed in for Whitburn as they beat Newcastle Benfield Reserves. Goals from Jonny Storey, Paolo Black and a Dale Johnson own goal saw Lindisfarne Custom Planet retain their interest in the promotion places against Willington Quay Saints, who replied late on through Mark Henderson and Carl McGuire. Chris Neve, Liam McVicar, Brain Allen and Mark Curry netted in Swalwell’s exciting win over Grainger Park, who had Shaun Sager, Liam Anderson and Robert Jefferson shoot home at the other end.